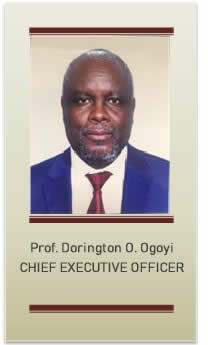 Prof. Dorington O. Ogoyi is the CEO of National Biosafety Authority . Prior to his appointment, Prof. Ogoyi was an Associate Professor at the Department of Biochemistry and Biotechnology and Director of Research and Development at the Technical University of Kenya (TUK). He also taught for several years at the Department of Biochemistry, University of Nairobi. Over the years, he has carried out research and mentored a number of graduate students in a wide range of research areas in Molecular Biology and Proteomics. Prof. Ogoyi obtained his BSc, MSc. and Ph.D. (Biochemistry) degrees from the University of Nairobi in the years 1986, 1990 and 1994, respectively. He gained his postdoctoral exposure at the Department of Experimental Zoology, University of Utrecht, Netherlands (1995-1996) and at the National Institute of Entomological Sciences (NISES), Tsukuba, Japan (2000-2002). He is also a holder of MBA (Strategic Mangement) from Moi University. Prof. Ogoyi is currently the National Focal point for the Biosafety Clearing House and a member of the Advisory Adhoc Committee on Biosafety Clearing House. Recently, he was also selected to represent the African region in the Compliance committee of the Cartegena Protocol on Biosafety. Prior to joining NBA, he participated in a number of Biotechnology and Biosafety awareness creation initiatives in the country incuding the agitation for the enactment of Biosafety Act, 2009. He is curretly a member of the African Food Safety expert network under the African Biosafety Network of Experties (ABNE). Since joining NBA he has facilitated the establisment of a functional Biosafety regulatory framework in Kenya through establishment of a transparent and prectictable mechanism of review of applications based on sound science. She is a qualified accountant and administrator with vast experience in the public sector. She holds a Master in Business Administration-Finance major and Bachelor’s Degree Finance Major from the University of Nairobi. She is also a CPA(K), a member of the Institute of Certified Public Accountants Kenya (ICPAK). She has held various senior management positions in the Kenya public sector including County Treasury Director, Finance Manager, Grants Manager, and Senior Accountant among others. She is an abridged trained trainer and participates a lot in civic education, youth counselling and secondary school motivational talks. 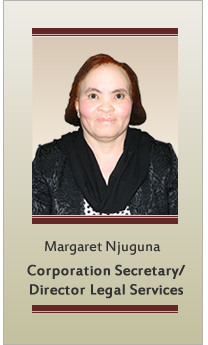 Ms. Margaret Njuguna is an advocate of the High Court of Kenya and a Certified Public Secretary (CPSK). She holds an LLB degree from the University of Nairobi, a post-graduate certificate in Biosafety in Plant Biotechnology from Ghent University, Belgium; and Masters degree in Governance and Ethics from Mount Kenya University. Ms. Njuguna also holds a B.Ed degree from the University of Nairobi. Ms. Njuguna has had extensive training in diverse areas including corporate governance, intellectual property laws, biosafety and leadership among others. Prior to joining NBA, she held various positions in the public sector and has extensive experience.